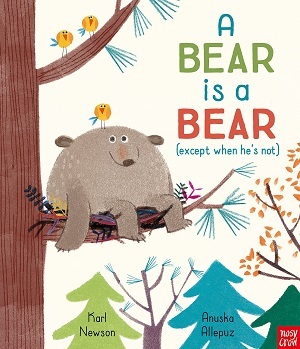 A wonderfully simpatico book about a tired bear who forgets who and what he is until a good sleep sees him wake up refreshed and knowledgeable. He tries to be all kinds of animals, from a bird to a fox, but the other animals’ habitats, behaviours and eating habits do not suit his skills and sensibility. After hibernating, he rediscovers the truth and finds his appetite. This is a warm and humorous book with rhyming text, a delightful exploration of the seasons through illustration, and the introduction of woodland creatures, including a moose. The text is written in an invitingly read-aloud style, as if the reader is a narrator talking to the bear. Endearing, friendly and colourful. You can buy it here. Another one for the fairly young, this will also be a favourite among teachers trying to encourage first time readers to push through. Characters Natalie and Alphonse first appeared in Alphonse, That is Not Okay To Do, primarily about sibling relationships, but this story takes these two little monsters through the course of learning to read. Although they adore books and stories, Natalie starts to struggle to learn to read and in the process, becomes disillusioned about books. With some help from her little brother, Alphonse, Natalie comes up with a strategy to rebuild her confidence, and before long stories and books are favourites again. A fantastic tale about perseverance that is close to home for many readers. Hirst is particularly clever in portraying a familiar domestic environment, with the monsters in typical childlike poses – be it on a swing or reading with legs in the air, sitting on a bus or playing in the bathroom. Look out for the wider cast of characters – a simple but effective way of drawing our modern world. You can buy it here. On a similar theme, although not so specifically on reading, this is Henn’s message that anyone can do anything if they put their mind to it. George is a rabbit with somewhat downcast ears. Everyone else in the woods is busy (birds who play chess, a squirrel who reads, a mouse who knits), but George doesn’t feel confident doing anything, and so does nothing. It is only when Bear comes up with a simple yet cunning plan that George finds the confidence to attempt everything and stop at nothing. Despite Bear’s scruffy looking appearance, she comes up trumps with wisdom, ensuring and inspiring self-belief in others. With Henn’s gentle colour palette, and deceptively simple plot and illustrations, this is a clever, inspirational little picture book that captures the essence of finding confidence, having a go, and importantly, enjoying oneself too (as well as, may I suggest, respecting the wisdom of elders). You can buy it here. Long a fan of Biddulph’s simple, almost monosyllabic, rhymes, it seems this author/illustrator can do no wrong. With this first of a brand new series, he has now turned his attention to that perennial love of pre-schoolers – dinosaurs. The illustrations are trademark Biddulph – simple shapes with almost three-dimensional texture, and a bold colour palette – dominated by green in this tree-filled landscape of our green protagonist dinosaur. 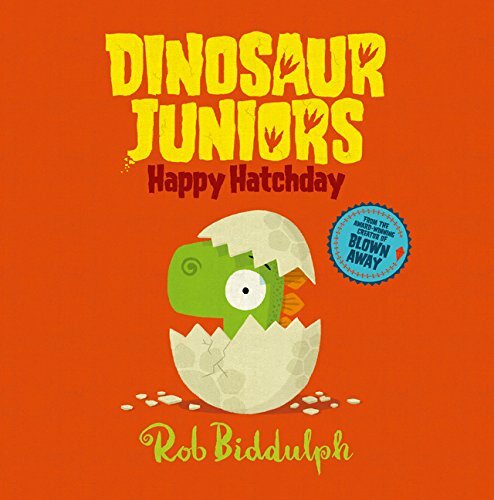 Biddulph brings a range of topics to this ostensibly simple text about a group of dinosaurs hatching – from counting, to fitting in, to naming dinosaurs, to friendship. Greg is the last to hatch, but is shown to be equally loved and appreciated by the end of the book. Biddulph’s bright colours and stylish illustrations will delight a whole truckload of wannabe palaeontologists. You can buy it here. 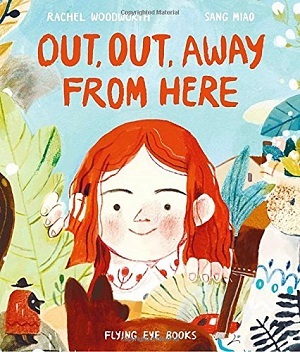 Taking a more complicated route with illustration is this dynamic and interesting new picture book about imagination. 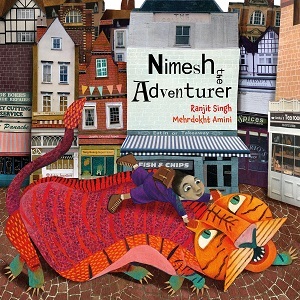 Nimesh is an Indian boy in London who uses his imagination to turn the ordinary into the extraordinary, from crossing the road to walking through the park on his way home from school. His school corridor is fairly nondescript: a range of notices upon the wall, a few cupboards and chairs, and a wall display of a hammerhead shark as part of shark week. But the following page leads the reader into Nimesh’s imagination, as he sees the corridor as an underwater labyrinth, a school door sprouting from the sea bed, sharks, plants and fish layered upon the school floor with the staircase and fire exit in the distance. The illustrations are collage – a remarkable letting loose of the illustrator to use their imagination as they envisage what Nimesh sees in his vivid mind. The entire book is related in dialogue too – as if the voice of reason is in conversation with the voice of imagination. Children will delight in finding the clue in each ‘ordinary’ picture of the ‘extraordinary’ to come. London becomes magical in this richly layered, diverse and fascinating tale. Extraordinarily different. You can buy it here. Another story revealed in collage illustrations is this interestingly busy book about a little mole with ADHD. 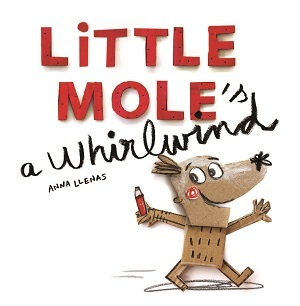 Mole can’t stop – the book is full of distraction and interaction as Mole moves through his school day at pace, fidgeting, forgetting, and playing the fool. Unfortunately, his peers find him irritating rather than funny, and his mole parents try to find a way of helping their whirlwind son. Serena the bunny gives Mole the space to experiment and explore, to talk and to listen, and finally Mole and his classmates accept who he is. This may be an unsubtle way of dealing with an issue – Mole at one point is illustrated with luggage labels ‘labelling’ him, but the overall premise is dealt with wonderfully in the busy collage style – pencil and cardboard drawings cut out and layered on top of each other. It creates a busy landscape and shows Mole’s world well. Frenzied but enjoyable. You can buy it here. 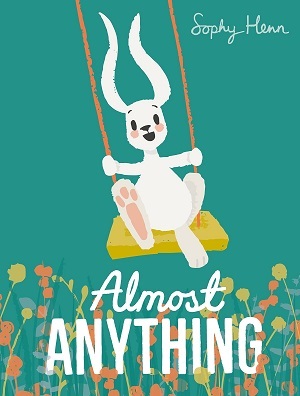 In complete contrast, this magically calm picture book for older readers tries to explore the concept of time. Taking subtlety to an extreme, the book reads as a poetic meditation, alluding to the subject matter rather than addressing it directly. Both picture and text combine to explore the elasticity of time – the calm pictures of seaside days contrast with the rushing for a train. There is musing on ageing and how time stretches back and seems far away, as well as added humour in the time spent waiting for a bus. There is the mindfulness of being in the present and appreciating the time now. With a mixture of striking landscapes from afar and up close domestic scenes, this is a thoughtful and somewhat wistful look at how we live and what we lose as we move through life. Clever parallel images appear throughout the book, letting the reader make connections between things and people, between time when young, and time when old. A sandcastle washes away to nothing, a train recedes into the distance, days turn to night. 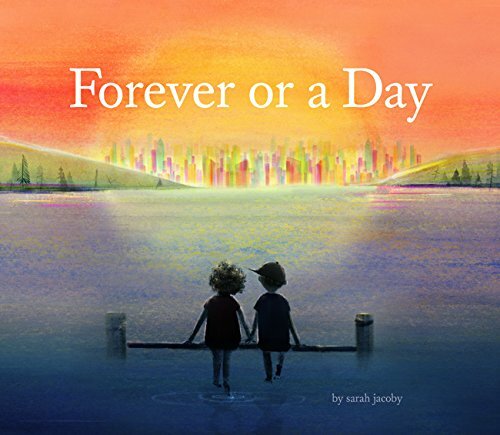 This is a complex, powerful book about one day, and how in memory a day may last forever. You can buy it here. 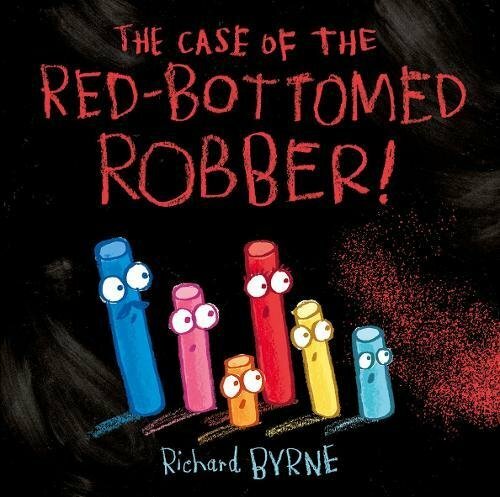 Master of the playful picture book, Byrne returns with this old-school tale about chalk who love to draw but get upset when their drawings are erased while they are out at play. In true mystery style, they investigate the ‘theft’ of their drawings, weighing up the evidence, which is chalk dust, and rounding up suspicious characters, including the scissors, glue and ruler. When they finally catch the robber red-handed, or rather ‘bottomed’, he feels unjustly accused – after all rubbing out is his raison d’etre. A funny tale, well told on black backgrounds representative of the chalkboard, children will delight in the ‘bottom’ tale, as well as the use of chalk with expressive personalities. Not too far removed from The Day the Crayons Quit, this picture book is shorter, and perfect for exploring a first mystery case, or just enjoying the colourful mess chalks can make. You can buy it here. 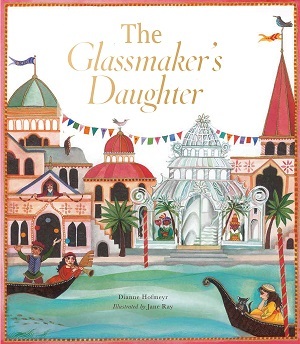 Far more long-lasting than chalk is coloured glass, in this exquisitely beautiful fairy tale of Daniela, the daughter of a 16th century Venetian glassmaker. Daniela is miserable, and her father offers a glass palace to the first person to make her smile. In true fairy tale trope, many try, including jugglers, mask makers and trumpet players, but only the last glassmaker manages, by making Daniela a mirror in which she can laugh at the sad miserable face she shows to the world. Although it feels like a classic princess tale, there is no ‘happy marriage’ at the end, and indeed those of both genders who try to make her smile are not motivated by thoughts of a wedding. This is about finding happiness within oneself rather than with another person – and how laughter is catching. But more than this, the picture book gives historical detail about glassmaking in Venice, and shows originality and immense detail in the exquisite illustrations – and a sparkle of glass when it shatters in the middle. An intriguing, historical, luxurious picture book that explores European culture. You can buy it here. A completely different illustrative style, but also in a book lavishly produced, is Woodworth’s tale of exploring emotion and escape. The red-haired narrator of this book acknowledges in very few words that sometimes she feels happy, but sometimes mad and sad, and sometimes all at once. When things are particularly overwhelming, she seeks escape in her imagination, a wild place populated by nature, with faces in the shapes, and strange creatures, with domestic objects inserted in wild landscapes, where the domestic merges with the wild. But at the end, she always comes back to her fully domestic family scene. Miao has had fun with the scant text, letting her own imagination create crazy landscapes within the mind. The fusing of the familiar with the strange and the dreamlike colours are particularly effective – from orange skies to flying fish, vivid blue seas and unidentifiable shapes in greys and greens. The domesticity is well executed too, from the yellow mac on rainy days to the zoomed in picture of the girl with her hands in her hair as she listens to the baby scream. This is another well thought out book of emotion and intensity, with just the right balance of darkness and depth to create a wonderful narrative to promote discussion of our emotions and how we respond to them. Excellent. You can buy it here. Reading is so satisfying because it’s one of the closest ways we have of getting inside someone else’s brain – and I don’t mean just inside the characters’ thoughts, but also the author’s. It’s fascinating to see how someone else’s mind works, how they deal with a particular situation, or even simply the fluffy rainbows and unicorns that bounce about in their head. One of the most striking ways some children have of utilising their imagination is in the creation of an imaginary friend. I’ve looked at this a little bit here to explore the whys of this phenomena – and trust me I think it’s something that can pervade adulthood too, especially for writers – I know my characters certainly live with me in one way or another. Rob Biddulph’s latest picture book character explores this phenomena with a very clear motive. Sid Gibbons invents his imaginary friend as a scapegoat – someone to blame when Sid himself messes up. His mother, wisely, demands evidence of this guilty persona, and Sid draws Kevin (his imaginary friend) in quite acute detail, and his mother, wisely again, doesn’t ‘disbelieve’ in the friend – only in the premise that Kevin, not Sid, is to blame. By the end of the story, empathy with Kevin shows Sid the error of his ways, (through a delightful little twist in the middle of the story), and before long Sid not only starts behaving, but enjoying his time with Kevin – and Biddulph sneakily lets the reader into the secret that Sid’s not the only child to have invented an imaginary friend. 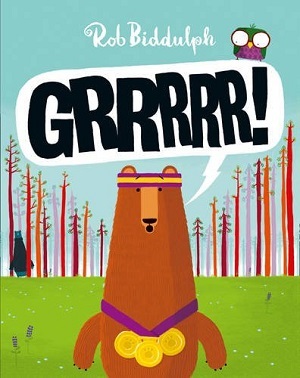 Biddulph brings his distinctive rhyming style to this picture book, but has expanded upon it, so the sentences are longer, but still retain the rhythm and bounce of his previous books. The illustrations though, are exquisite. Freed from the animals of Penguin Blue, Biddulph not only portrays his humans with style and personality – from Sid’s trapper hat to his mother’s slippers – but also crafts the most appealing make-believe world, complete with a vast array of colourful flowers, spotty rainbows, and daft made-up beastie creatures. Shot through with a wide colour palate, they are nostalgic for adults used to 1970’s fashions, and vibrant for young children. Biddulph has a certain talent for images that appear simple, but are layered with detail. It’s fun to try to copy them – many children do (and for those with adults on twitter, you can follow his work on #drawwithRob). What’s more the moral messages throughout – not blaming others, saying sorry, understanding others, cherishing friendship – aren’t spelled out in a pompous saccharine way, but carefully dripped through the story so that they are gently absorbed. My only quibble is the portrayal of the Dad behind a newspaper and the mother with takeaway coffee and ugg boots, although in Biddulph’s defence perhaps it is just an accurate reflection of UK middle-class suburbia. Full marks though for the diversity of the children on the last pages – there’ll be much fun for children in spotting the different children, different beasties and familiar playground equipment. Watch out too for allusions to prior Biddulph picture books, and the final image, which suggests that sometimes Biddulph too escapes to his own imaginary world. You can buy your own copy here. Another celebrity pens a children’s book (sigh). Luckily for all of us though, it’s really rather good. Radio Boy tells the story of wannabe DJ Spike Hughes, dejected and downcast after being sacked from his slot on hospital radio, and then not chosen by his Head Teacher to broadcast on the new school radio show. His Dad provides him with the impetus to set up a secret radio show from his garden shed, and Spike is soon broadcasting with his voice disguised, under the name of Radio Boy. But before long, his success goes to his head, and Spike is calling rival warfare on the evil Head Teacher from his radio studio, and broadcasting all sorts of trouble. The book is told in the first person. Spike desperately wants to be a radio DJ, and so his voice, even when written down, needs to be sparkling, witty and appealing – as much as an eleven year old boy’s can be. Luckily for Christian O’Connell, this part of the book does work – even if at times it feels overly-laboured to an adult reader. Spike not only reels off a host of sniggersome anecdotes, but he also lays his emotions bare in an easy-to-read style. 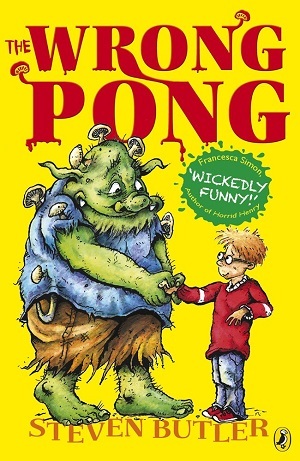 The other characters are fun and believable, especially Spike’s two best friends. Artie is into vintage music (this made me feel old) played on vinyl, and Holly excels at producing and is the brains behind much of the hard graft in securing equipment and setting it up. Spike’s parents are great secondary characters in their own way – not always united in their parenting! If anything the evilness of the Headmaster is slightly overstated and stereotypical, but works as a plot device, so it’s easy to go along with it. In fact, it’s the plot that drives the story more than anything, providing the pace and proving to be particularly page-turning. There’s a race against time for people to discover who Radio Boy really is, and the book pulls the reader towards the end. There’s also an undercurrent of what it means to be popular in school, and the responsibility that goes with being famous, as well as a clear message about having a lack of self-confidence. Spike fits into the realm of other boy protagonists for this age range who need a boost so that they don’t feel like such a loser – Wimpy Kid, The World of Norm, Timmy Failure, Middle School – but this is all part of his appeal. Watch out for the Rob Biddulph illustrations throughout, particularly Spike’s sister mid-yell. They not only add a fun element to the book, dominating some pages, but also give character and setting. With so much readily available technology for children, the essence of the book remains true to life – such things as clandestine streaming radio stations are possible. And mixed with a good brand of childish humour, this is sure to be a chart hit. Aimed at age 9+ years. You can buy a copy here. The rhyming works quite well, although I would quibble that it contains extraordinarily difficult names for children to read and pronounce, (Fred being the exception) but Rob Biddulph’s strength in his artistry pulsates through the warm and vibrant illustrations. Not only are the animals portrayed with character and depth, but they are humorous, bold and colourful. Slightly reminiscent of the simplicity of Oliver Jeffers’ creations, the animals’ eyes, eyebrows and mouths manage to convey emotional depth. As well as warming to Fred the Bear, the reader can spot all the various backstories in the illustrations, from the growing love affair of the rabbits, and their sensitivity to noise, to the deer’s underpants, owls with mobile phones, and pirate bears. There’s even an appearance by Penguin Blue from Blown Away. Numerous cultural references abound too – from the growl-o-meter harking back to old TV game shows to the scoreboards that are reminiscent of retro computer games. The blending of the bears’ bodies to the trees in the wood is also clever and effective. 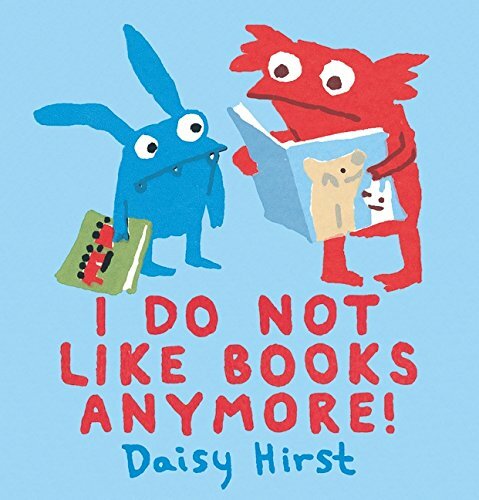 By appealing to both grown-ups and children, and by using humour, morality and a good story, as well as conveying greater depth in his illustrations, Biddulph appears to have cracked it again. This author/illustrator certainly hasn’t lost his Grrrrr! To buy a copy of this title you can click here or see the Amazon sidebar. Please note this review was from a mock-up of printed pages rather than the finished publication. Last weekend I attended the FCBG Conference. The FCBG aims to promote enjoyment in children’s books and accessibility of those books to all – as well as attempting to put the right book in the right child’s hands. The theme of the conference was ‘Inspire’ and I was inspired in three ways. Firstly, by those who seek to examine fresh ways of looking at narrative in children’s publishing and what can be achieved. From the award-winning narrative apps, such as Jack and the Beanstalk, of Nosy Crow Publishers, presented by their supremely dynamic MD, Kate Wilson, to the spoken word artist Steve Camden (aka PolarBear), author of Tape and the soon to be published It’s About Love, who introduces his young adult novels with performance poetry. See here. In fact, understanding and being able to decode narrative is critical for a child’s development of empathy. And taking time to be engaged in a narrative and not be easily distracted can contribute to a child’s wellbeing. The writer Nicola Morgan explained that a big report on offline/online reading will be published in about 2017/2018, but that it is notable that reading offline does lend itself to fewer distractions. Everyone at the conference pointed to print books as an integral part of the narrative process as well as whatever other technologies we may apply. 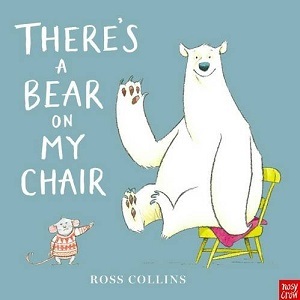 Books I’m looking forward to from Nosy Crow in the near future include There’s a Bear on My Chair by Ross Collins, the next in the Wigglesbottom Primary series by Pamela Butchart and Becka Moor, and My Brother is a Superhero by David Solomons. Reviews to follow. Secondly, I was inspired by people working within the children’s publishing industry and others I met who are simply sharing their incredible book knowledge. Philip Ardagh is passionate about books and writes some startlingly funny ones. I’m hoping to review his book The Unlikely Outlaws soon, and he has also written a funny series called The Grunts, and Awful End. Sophy Henn and Rob Biddulph spoke about creating their picture books, PomPom Gets the Grumps and Blown Away respectively, which I’ve reviewed previously. Click on the titles to read my reviews. There was also much to learn about non-fiction titles, and I had a lovely chat with Nicola Davies who told me about her new theatre venture at the Hay Literary Festival. Nicola bubbles over with enthusiasm when speaking about her books, which weave a narrative structure within non-fiction to create spellbinding titles. 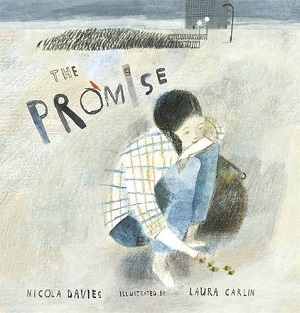 One of my favourite titles of hers is The Promise, a picture book that seems to use osmosis to seamlessly transfer the author’s love for trees and nature onto the reader. Not only that but it imparts the idea that just because a child has a difficult start in life, it doesn’t mean that the rest of life will be equally difficult. Lastly of course, it is all about the power of the book; the power of the story to tell you that you are not alone, and as Frank Cottrell Boyce (author of The Astounding Broccoli Boy) put it “to break you free of the prison of the present”. Getting the right book into your own hands can inspire you in the same way that putting the right book in the hands of the right child can inspire them for life. Frank Cottrell Boyce revealed that simply reading Heidi empowered someone he knew to understand that happiness was a possibility for them despite all their hardship. On a lighter note, Steven Butler (author of The Wrong Pong) realised that reading might be for him after all when he realised that it was possible to put the word ‘knickers’ in a children’s book – he discovered it in Roald Dahl’s Revolting Rhymes! I came away with MORE knowledge about children’s books and subsequently a better idea of which books I can recommend for your child. It’s about getting children reading. You can access the FCBG website here.